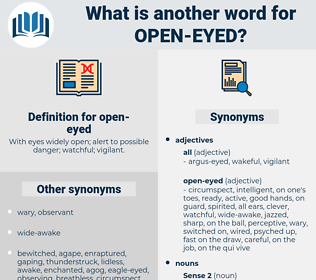 What is another word for open-eyed? 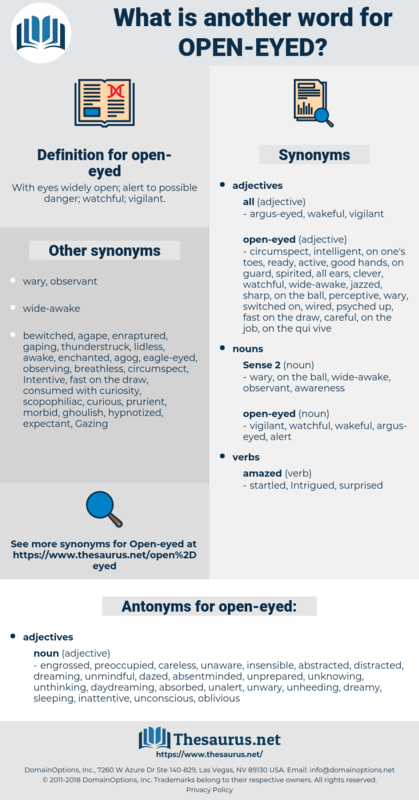 With eyes widely open; alert to possible danger; watchful; vigilant. engrossed, preoccupied, careless, unaware, insensible, abstracted, distracted, dreaming, unmindful, dazed, absentminded, unprepared, unknowing, unthinking, daydreaming, absorbed, unalert, unwary, unheeding, dreamy, sleeping, inattentive, unconscious, oblivious, faraway, unready, unvigilant, absent, asleep, unwatchful, unwitting, heedless.